Wednesday, November 23rd, we take advantage of Walmart and Dollar Tree in Cortez, Colorado, after parking overnight at the Walmart parking lot. Heading south to Shiprock, New Mexico, and then east through Farmington to Bloomfield, New Mexico, I am dismayed at the unattractiveness of the scenery. The land, in its natural state, would have its own special kind of stark beauty, but the coming of the “white man” and the subsequent mining, drilling, and construction has left the land trashed. To see this is sad to me. 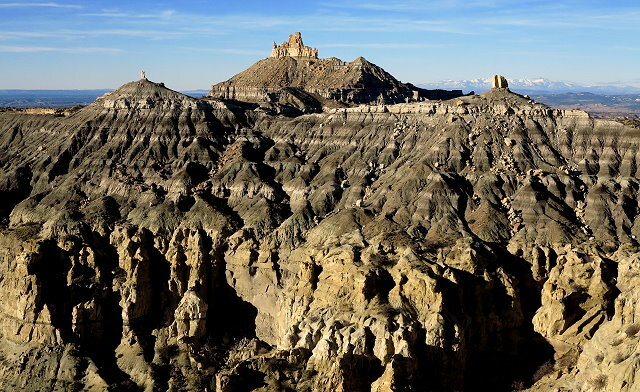 South of Bloomfield, in the badlands owned by the BLM, is the Angel Peak Recreation Area, our destination for tonight. 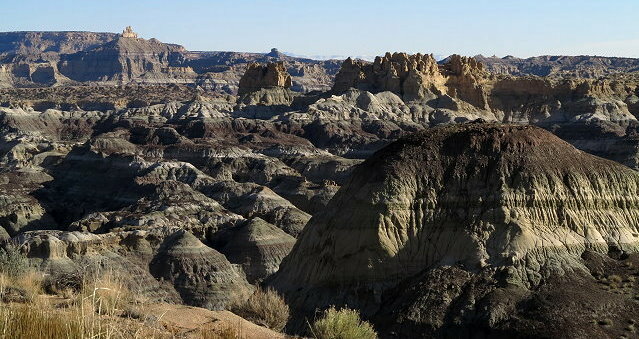 The road into the campground is muddy in spots due to the recent rains, and I am a bit uneasy on the drive in, but we arrive intact and find a campsite with a great view of the badlands and Angel Peak. 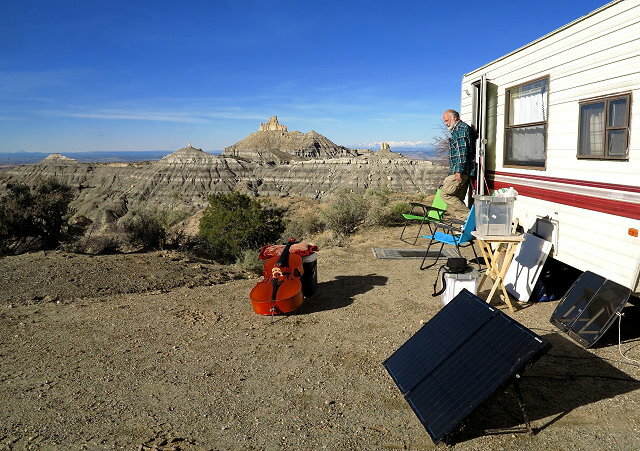 After we get set up, although a bit breezy, it is mild enough that I can play cello outside for awhile. Later in the afternoon, I hike out to a view point and strike up a conversation with a very friendly lady from Pennsylvania who is here taking photos. We have a nice chicken dinner with pan-roasted potatoes and carrots, kind of a pre-Thanksgiving dinner, since we will be traveling a longer distance tomorrow. Big gusts in the night cause Terry to shake now and then. Although this place has a unique beauty, I would not want to stay longer; something about it doesn’t quite sit right with me. Thursday, November 24th, Thanksgiving Day. We have breakfast, pack up, and are on our way by 10:00. We talk about environmental concerns as we drive, as the need is so obvious with the land being trashed, the sky polluted, and drought taking its toll. 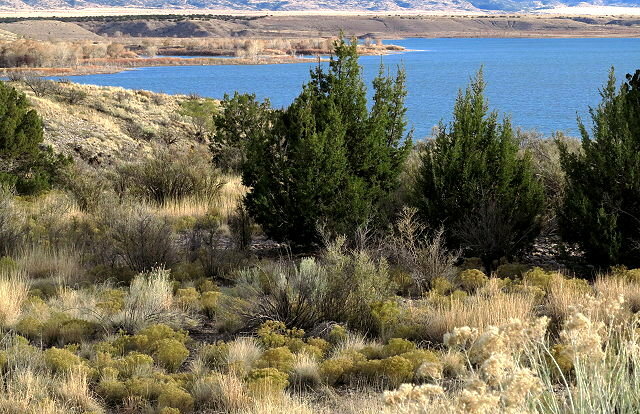 We arrive at Cochiti Lake Campground in the afternoon and find a good site with a view of the mountains to the north and an arm of the reservoir behind us. I send messages to my siblings and my kids, being grateful for them and wanting to know how they are all doing. Becka calls and as she tells me what she is fixing for Thanksgiving dinner, I am inspired to make a fancy applesauce to go with our left-over chicken. Matt also calls and almost everyone else sends me a text in reply to my message. We hear cranes overhead – I wonder if they are stopping at the reservoir for the night; I think it is too far north for them to be wintering here. We are glad to be here and looking forward to spending a few days with no travel. I imagine the sound of the cello in those canyons has to be something spectacular. 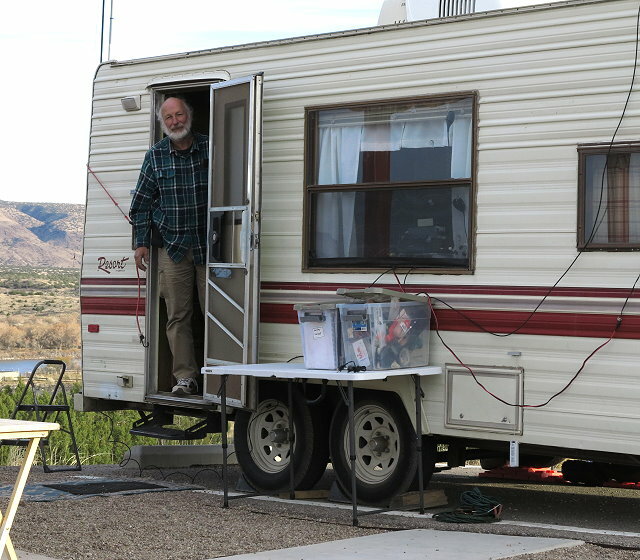 How mystical for any other camper to hear its echo. 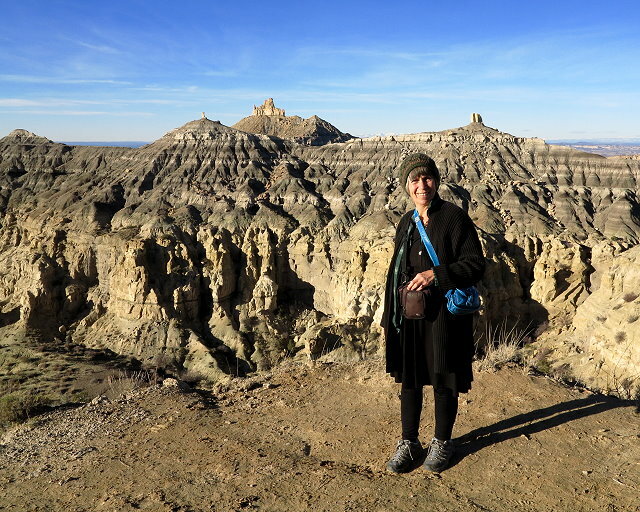 The lady who took my photo: she struck up a conversation because I had been playing while she was taking photos and she wanted to show me that she had done a short video of the canyon so that she could have the sound of the cello in the background. That was quite special. Regarding the composition of your visually-interesting photo, “Angel Peak Cello” : The contrasts are stunning! – Between that gray, eroding, defeated mountain range in/as the background, against the vibrant burnt orange color of the refined, purposefully- shapely cello that patiently awaits (but still it beckons) human interaction so it can co-Create a piece/a time of vibrational/audio Joy, which can serve as, at least, a small Victory! 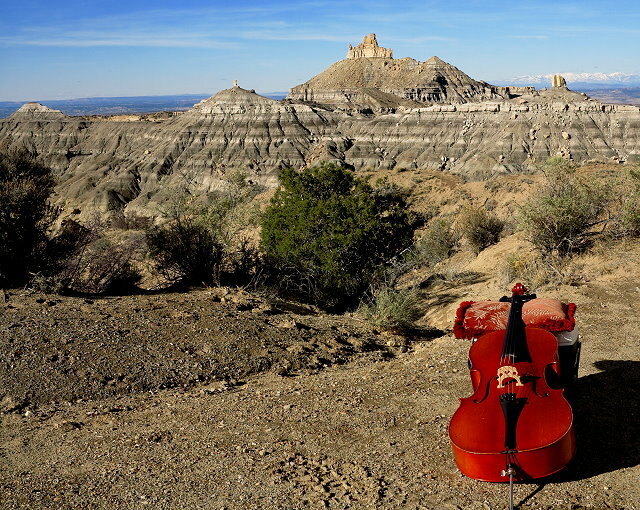 I love your way of seeing and describing the contrast between the badlands and the cello. Thanks for your comment!